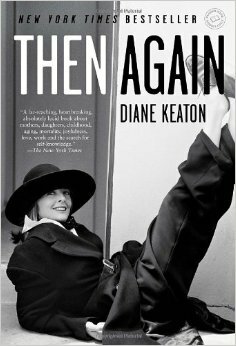 I received Diane Keaton’s autobiography, Then Again, as a birthday gift. I’m grateful that I did, because if I hadn’t I likely would never have picked up this fascinating, honest, and sometimes (endearingly) depressing book. After her mother’s death, Diane Keaton ran across dozens and dozens of journals her mother had kept. They’re all packed full of anecdotes, pictures, clippings, collages and tons of other really fascinating stuff. Then Again is the story of both Diane’s life and that of her mother’s. In some parts it’s about just one of them, in others it investigates the sometimes bizarre ways that their lives overlapped. This is an extremely raw and brave book. Diane holds nothing back, and while I’ve seen other reviewers mention that she comes off as whiny or a name-dropper, I couldn’t disagree more. There are parts of this story told through Diane’s letters and own journals, and yes sometimes her mid-20s self whined about things. So goes it when you’re in your 20s. She could have sugarcoated that, she certainly could have painted herself in a better light, but it wouldn’t have the honest feel it does. While I’m sure this book only covers 1% of who Diane Keaton really is as a person, I was struck with the intimacy in this book and felt when it was all over that I’d been invited to witness a truly tremendous journey. Highly recommended to fans of Diane Keaton and to fans of memoirs / autobiographies. This entry was posted in book reviews, memoir and tagged book review, keaton, memoir. Bookmark the permalink.